Track...These statements alone cannot be translated yet into what it means for our upcoming winter. In general when you see the SOI increase as it is currently, and forecast to do over most of the this month it typicaly means a stronger easterly(coming from the east moving west) component to the winds over the Tropical Pac. Picture the Tropical Pac like a big bath tub with the western side where the warm water is running. 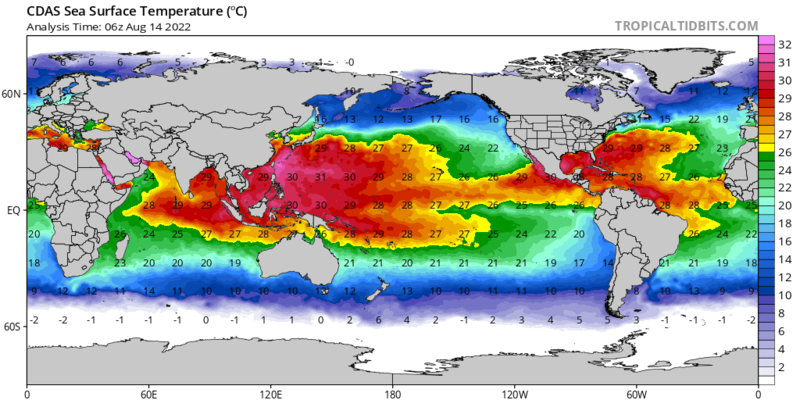 In general the western Trop Pac has warmer water temps than the eastern half. Now picture you have a giant Fan blowing over the surface of the bathtub(Trop Pac). If the Fan is placed on the western side (westerly winds) faceing east towards the Americas then you might visualize the warmer waters being pushed east. If those westerly winds persist long enough(which will often times be seen when the SOI is strongly negative) and strong enough, then the warmer western Pac ends up mixing with the cooler waters to the east warming them to above normal temps relative to average....El Nino conditions. Currently the SOi is such that Easterly winds are predicted to be anomalously strong over the next month. Place the Fan on the eatern side of the Pac and push the warmer waters back west and aloww the cooler sub surface waters to rise to replace the water being pushed west cooling the Trop Pac...La Nina conditions. Of course this is very simply put but the overall idea is there. Nice post and good explanation. Another way I'd differentiate it that La Nina is essentially an amplification of typical conditions (enhanced easterly trades) while, conversely, El Nino is a deceleration of typical conditions or sometimes complete reversal (particularly like last winter, when we witnessed innumerable robust WLY wind bursts). The thermocline is more (less) steep in a La Nina (El Nino) given the tendency for a greater (lesser) depth of warm water in the eastern Pacific in a El Nino (La Nina). There is a very potent ELY wind burst forecasted over the next week, which should be the strongest thus far in this -ENSO event. It will be interesting to see the extent to which sea surface temperatures respond in the subsequent weeks. My guess is we probably do manage to reach the weak La Nina threshold, at least for a few months (possibly through winter). Thank you. I'm glad to see you back on this site for discussions. I tried to keep things as simple as possible for maximum understanding. Its interesting to me to see many people, meteorologists and weather enthusiast alike, look at this up coming winter relative to ENSO status as so cut and dry or like a switch turning on and off relative to a weak La nina vs a La Nada. Personally unless La Nina develops much stronger than anticipated or if some of the other divers change drastically between now an Nov/Dec, for the most part the overall ENSO influences should be similar regardless of the textbook defintion. In some ways this year may end up similar to winter of 2014/15 when there was the debate about if there was a weak El Nino influence on the atmosphere or not. By the text book the criteria was not met until well into the Spring and summer of 2015 if I'm remembering correctly. That winter had an El Nino leaning La Nada; whereas, this year may have a La Nina leaning La Nada. Anyway a few years back I would read these types of posts and be like what the fff are they talking about, so I figured Id expand a little on the what the SOI (Southern Oscillation Index) is for some of the lurkers of the forum and try to explain why/how it affects the status of the tropical pacific. The Southern Oscillation Index (SOI) is a standardized index based on the observed sea level pressure differences between Tahiti and Darwin, Australia. The SOI is one measure of the large-scale fluctuations in air pressure occurring between the western and eastern tropical Pacific (i.e., the state of the Southern Oscillation) during El Niño and La Niña episodes. In general, smoothed time series of the SOI correspond very well with changes in ocean temperatures across the eastern tropical Pacific. The negative phase of the SOI represents below-normal air pressure at Tahiti and above-normal air pressure at Darwin. Prolonged periods of negative (positive) SOI values coincide with abnormally warm (cold) ocean waters across the eastern tropical Pacific typical of El Niño (La Niña) episodes. As a general rule to follow is in order to have the SO part of ENSO in a La Nina(El Nino) status the SOI avg 90 day value should be above +8.0 (below -8.0) respectively, with a value between -8.0 and +8.0 characterizing a La Nada. The image above is the Euro MSLP anomaly map from last nights 00z run. You can clearly see that high pressure(HP) dominates Tahiti whereas low pressure LP dominates Darwin. 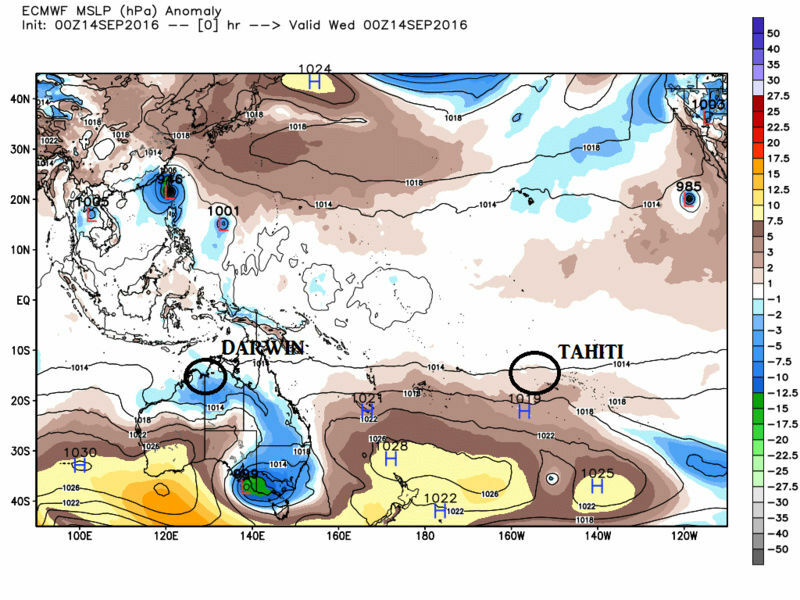 For the next two weeks there is a forecast that will cont to see higher pressures in Tahiti relative to Darwin with fluxuations throughout. As we all know from basic earth science winds flow from areas of HP to areas of LP. That in mind one can clearly visualize the stronger/steeper this gradient between these two locations the stronger and faster these easterly (from east to west) will move. Now refer to the map above that Isotherm posted about the 850h-PA zonal wind anomalies. The purple colors he is referring, and Frank showed a similar map from a diff site but showing the same 850 h-PA zonal wind anomalies, is showing us the stronger than normal easterlies forecasted which is likely in a direct correlation with the pressure differences described above which can also be seen quite nicely by following the SOI as well. Remember the SOI value is a result of these pressure diffences, so by simply following these values over time you can get a broad sense of how strong, which direction, and for how long the zonal winds are moving the waters of the trop Pac around (via the bathtub analogy described above) and thereby giving us a "general" idea of where the SST anomalies are going within the Trop Pac. Here is the link for the SOI. First row is the daily SOI value; second row is the 30day avg, and third row is the 90avg. This site gives the last 30days of these values. It is possible that if there are several more easterly bursts similar or close in magnitude over the next 1-3months that more significant upwelling's could occur. This we will simply have to wait and see how it shakes out. We just don't have good enough modeling to accurately predict how this part of the equation plays out. So I hope this has given many a little more of an understanding on this part of the ENSO status, so that when Frank and Isotherm and others put out there winter forecasts and you come across their discussions on the status of the ENSO you will actually have an idea what they are talking about.